The Open University (OU) has named its first recipient of an astrobiology award in memory of the late Professor Barrie Jones – an OU astrobiologist. More than 2000 years ago the question whether we are alone in the universe was first asked. And we live in a time where, for the first time in history, we have the tools to answer it. Among the thousands of new worlds discovered, so-called exoplanets, are already the first ones that could potentially be habitats like our own Earth. With the next generation of telescopes we will scout them for biosignatures – the pre-conditions and indications of life. Our models combine data from remote planets with geographical and atmospheric data from Earth to determine how our planet would have looked billions of years ago, or a hot or cool super- or Mini-Earth using a technique called spectral analysis, which generates a spectral fingerprint of light for a planet. Besides inspiring a new era of astronomic exploration and discovery, this work could also “give us the opportunity to understand our own planet better, and perhaps even a first glimpse into our potential future”. Seeing our own Pale Blue Dot as this tiny dot suspended in the vast space inspires not only awe but also a responsibility to care for our fragile world. And now we are standing on the cusp of discovery, mapping our place among the thousands of worlds in the night sky. 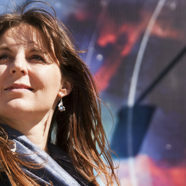 Lisa Kaltenegger is the director of the Carl Sagan Institute at Cornell and an Associate Professor of Cornell’s astronomy department. Her research to detect signs of life on other worlds uses the light fingerprints of a planet to tease out details of its environment from light years away.